Discussion in 'The Lounge' started by DH Diva, Jan 4, 2008. Oh youtube, how I love thee! Here's a little preview of the inspiration for a little project we're working on right now. It's called group b rally cross. It was a class in european rally cross racing that ran from the early 80's, until the late 80's when it was banned because it was deemed too dangerous. Group B was an unlimited engine displacement/weight class. A lot of this footage is really old, and filled with bad euro dance music, but the driving is incredible. So, how is this at all relevant to a project I'm working on you ask? We're building a vintage rally cross car! I'll post some pics when she's ready for the road. We still need to pick up some 5 point harnesses, and finish the paint, an a couple little mechanical things. I can't wait to practice pendulum turns!!! Cool stuff for sure! Thanks for sharing. Now, how about some pictures of your project? The paint should be done this weekend, so good things come to those who wait. I'll get some up on Monday. No pics until the racing strips are done. Rally cars must have racing strips, it's a requirement. I don't know who is crazier, the drivers or the spectators. Group B cars were fvcking mean, Those engines are growling! I love the slow-mo jump with exhaust flash in the first clip. Euro's love their rally cross. Spectators 20 deep in spot, on the course, grabbing their hair with anxiety. They might be crazy, but at least their idea of spectating doesn't involve a lazy boy and a bag of doritos. DH Diva, have you seen "too fast to race"? it's brilliant, all about the Group B era. No I haven't, but a friend of mine just got it so I'm definitely borrowing it! I've heard group b cars were as fast if not faster than modern WRC cars, which is impressive given that was 20 years ago now. Makes those drift kiddies look like well kiddies. Awesome. Yeah, which is funny because didn't Nascar claim to "invent" the first in car hydration system? Thanks DH. Always been a fan of the Rally cars. Good way to make the best of the storm wreaking havoc outside. Mmmm. New rally. I'm going to have to watch the vids on his site. Here's a little tribute video to one of the coolest rally drivers ever, Colin Mcrae. Again, not the best music choice, but great driving footage!! if I am not mistaken, lancia held the record for wins in rally racing. Hey neanderthal,have you seen the video footage of that pan american race back in the 40's/50's that Walt has where the "poor" Mexican spectators get clobbered as they mis-judge how fast the cars were aproaching? There's a scorpion (US version of the montecarlo) for sale on craigslist down in san diego! 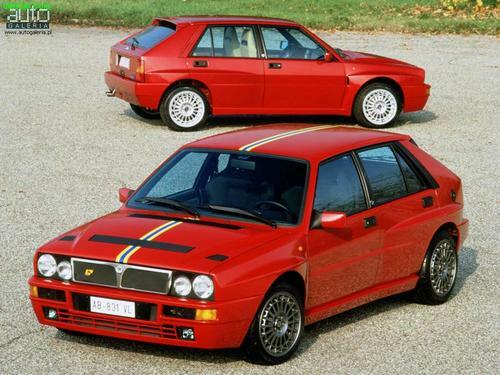 I would love to have a lancia for rally, just for coolness factor but I can't even imagine how hard it would be to find parts. Lancia Statos, Lacia Delta Integrale, Audio Coupe Quattro SWB, what ever the Peugot modee is (you know the Le car).....All my old school euro dream cars. This video has remotivated me to get an old 5cyl Audi Quattro winter beater car (coupe, 80, 90, 4000, don't care...) with monster snow tires. Just gotta rid myself of ye olde P-car. that is basically a Fiat if I am not mistaken! a saweeet car none the less but I believe that is when Fiat was in control of Lancia and the cars were not as revolutionary as when they were still owned by Lancia. Thanks for the links, we used to watch this stuff in the past. The superior driving skills and comitment of spectators are astonishing. I've made a little search and managed to found the vid which shows that spectators were basically part of the race (jump from 1.50). Anyone else noticed the lack of overweight people in footages from that time ? Wow. I've located a nearby Audi 200CS Turbo Quattro. Niice brings back good memories.